Turbo Scrub is a rechargeable cordless handheld power scrubber which is designed to clean the home. You can use this product to deal with really difficult stains each day. The product comes with different heads that you can attach to the top of the spinner to reach every part of the home to get perfect cleaning. That means you can easily reach all the difficult areas of your home especially the tops and corners of cabinets, and the small spaces near your shower or bathroom floor. Here is a detailed Turbo Scrub 360 Review, so that you can make a wise decision. Moreover, you will also learn How To use Turbo Scrub 360. No more rubbing or scrubbing – No need of kneeling, bending, or getting on your hands and knees to clean your home. You can use your favourite cleaning product – no more abrasive or harsh cleaners. Its Powerful head rotates at over 300 RPM so you can efficiently scrub and clean areas with very less effort. The head of the product is waterproof, So do not worry to submerge it in the tub or pool. Its compact and Lightweight design allows you to clean every difficult area. The device comes with 3 interchangeable brush heads that will help you to do various cleaning jobs efficiently. -The Round Brush Head is used for large surface cleaning. -Its Cone Brush Head is used to clean corners, grout lines, and all those tough to reach areas. -The Flat Brush Head is used to clean small flat surfaces. -All you have to do is just attach the extension pole to clean low or high places. You can continuously use it 40-60 minutes on a single charge. Best for people with arthritis problem or have difficulty bending. It is designed to Clean Burners & Cooktops, Vents & Returns, Baseboards, Sliding DoorTracks, Tile Grout & Corners, Toilets, Fixtures & Faucets, Bathtubs, Patio Furniture, Kitchen Sinks, Pools & Hot Tubs, Even Vehicles! Turbo Scrub is a rechargeable handheld cordless scrubber which comes with a waterproof head that rotates at over 300 RPM speed. 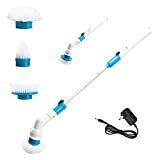 You can attach 3-interchangeable brushes to the head for better cleaning- the Round Brush is for large surface cleaning, the Cone Brush is for grout lines and other difficult to reach areas, and the Flat Brush Head is for small, flat surfaces. As per its manufacturing company, the every bristles on each brush fight deep with strain and dirt to remove it. This will help you to scrub and clean the surfaces with minimal effort. You can efficiently clean burners and cooktops, fixtures and faucets, kitchen sinks, toilets, hard water stains in the shower, vehicles, and much more. The product comes with an extension arm.You can attach the arm to your Turbo Scrub, and now you can easily clean high and low surfaces. With extension arm, you need not bend, or getting on your hands and knees for cleaning. when you are done with cleaning, you can clean the Turbo Scrub with warm water and mild detergent. Most of its users give it positive feedback. CORDLESS: This spin scrubber you don't have to worry about that the cord will disturb you to cleaning other area. makes cleaning more convenient and hassle-free. WATERPROOF: The water-proof seal design makes it safe to operate under wet conditions such as showers, tubs, sinks, etc. HIGH ROTATE SPEED: The cleaning brush head turns in 360 degree with high rotate speed, which clean stains in a more complete way. GUARANTEE: We provided 2 years warranty period. If you have any unsatisfied or problem for our product, please contact us in advance, we will try our best to service for you! NEW & IMPROVED: Longer battery and increased torque for better performance - get 30+ minutes operational power with 20% longer battery life and better cleaning results with 15% improved torque! CORDLESS & RECHARGEABLE: Cordless scrubbing makes cleaning a breeze and hassle-free. Plug-in and charge Clorox Scrubtastic for the first time for 4 hours, followed by 4 to 6-hour subsequent charges after each use. Secure that all parts are connected and firmly attached together to ensure proper charging. ALL-AROUND CLEANER: Clorox Scrubtastic comes with 3 brush heads - Grout brush for difficult-to-reach or tight spaces; Flat Surface brush for, well flat surfaces; and the larger Round brush for bigger jobs or smooth surfaces like bathroom tiles. For best results, use in conjunction with your favorite Clorox cleaner to make tough cleaning jobs simple! CONVENIENT POWER CLEANING TOOL: Use the power of motion to get a deep clean with less effort. Clorox Scrubtastic multi-purpose powered cleaning tool uses over 300 RPM to scrub away tough stains or dirt with ease. With the 39" extendable handle, reach and clean high areas areas like ceilings or even airconditioning vents. Time to say good bye to those back-breaking manual scrubbers or unsafe cleaning practices when reaching to clean high places!NEW Flat Surface brush for, well flat surfaces; and the larger Round brush for bigger jobs or smooth surfaces like bathroom tiles. For best results, use in conjunction with your favorite Clorox cleaner to make tough cleaning jobs simple! After reading our Turbo Scrub 360 review 2019 what do you think about this product? whether it is important for you or not. do share your reviews in our comment section. Also, want to know more about it then read customers Turbo Scrub 360 review on Amazon. 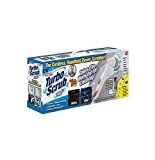 This Turbo Scrub is a very compact in size, rechargeable and cordless power scrubber helps you to deals with tough messes, dirt and grime quick and easy. So, you can go with the product.